Well, we’re past the half-way point on this project. I must say it’s been an eye-opener for me. 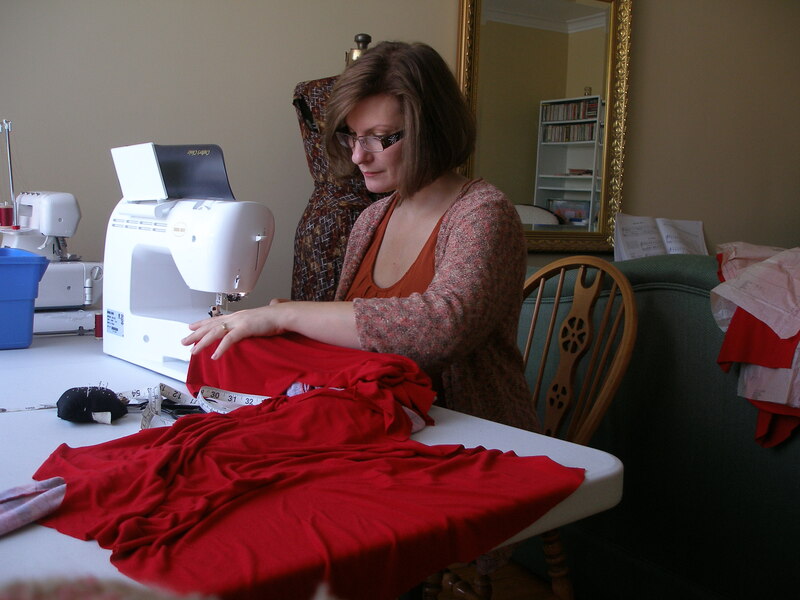 I know I sew a lot, but compared to other people in sewing blogland who have been posting their progress through this project, I don’t really sew much. I just don’t have the time to sit and sew endlessly. BTW, I really am disliking the top in the photo. The colour is great, but it’s just…. I dunno….. blah the more I wear it. I’ve relegated it to schlepping-around-the-house wear. My review of it is here. You can see I’m busy sewing something red. Day 18: Well, here’s the something red! Today was the first Saturday in full DD1, 2, and 3’s schedule. So we were off to ballet class this morning and then DD1 had a harp lesson after lunch. 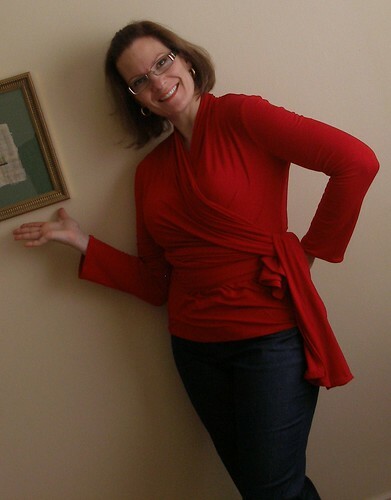 Here’s how I wore the card-wrap today, and since the picture was in the way, I thought I’d do a Vanna White imitation – HA! The pattern sewed up very quickly. The front of the cardigan is very long – past my knees – but I thought it would be a nice addition to my closet because of the variations the length allows. 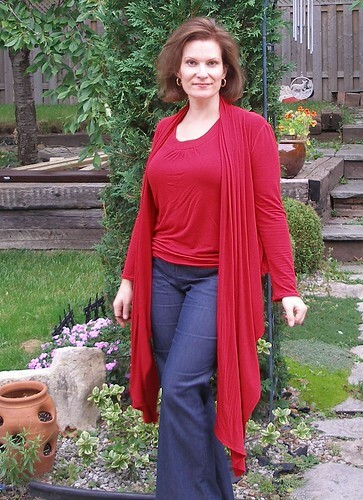 I used a rayon-lycra knit from Fabricland – the last of the stash that I purchased last week to make some tops for SSS. It’s been really cool here in Toronto – BANG! September arrives, the weather drops 10°C! So much for using my summer projects for SSS…. I made no changes to the pattern – didn’t even bother doing an FBA. But I did cut it down a full size given the loose fit of my previous Simplicity SSS project. The top is a bit long for my taste, too, but I think it works well with the length of the cardigan. < Previous First-ever BurdaStyle project fininshed! YAY!